I laughed so hard I think I came a little. AHAHAHAHAHAH... oh, you spoiled it for me. lmao i just shat brix! Omg that's full of win. 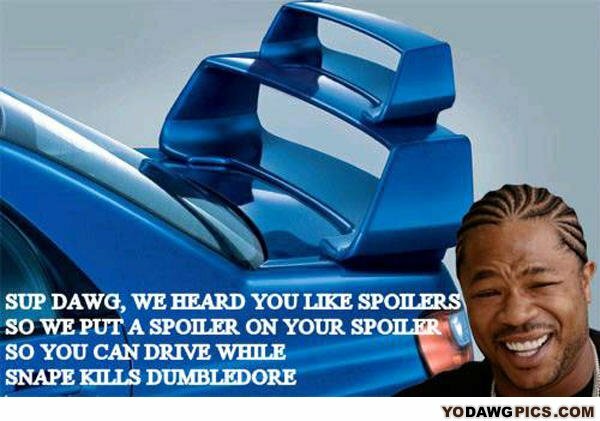 Yo dawg so we heard you like spoilers , so we put a spoiler on your spoiler so you can drive while ghost and roach get killed by shepherd. Yo dawg i heard you like spoilers, so we put a spoiler on your spoiler so you can drive while you lose the game. Moral: Yo Exbiscuit I heard you got really pissed at me for calling you Exbiscuit online so I made you a biscuit so you can read this comment while I call you Exbiscuit which at this point you ate your biscuit making it an Ex-biscuit. hahahahahahahahahahahahahahahahahha ooooooh my goood!!!!!!! i lold sooo hard!!! !